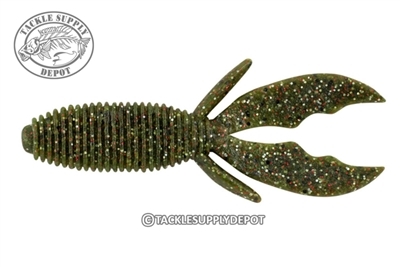 The Berkley Powerbait MaxScent Creature Hawg is built for heavy cover applications with a reinforced scenting and a streamline profile that slips in and out of tight spots with ease. The ribbed body maximizes water displacement and scent release as well as conceals the hook point. When flipping and pitching weed mats the Powerbait MaxScent Creature Hawg gets the job done. PowerBait MaxScent line of baits release a super-charged scent field attracting fish in a way never before seen. This all-new material is perfect for finesse presentations with ultra-realistic texture and natural matte colors to fool the hardest to catch fish. The soft yet durable material provides for life-like action and easier hook-ups producing multiple fish on each bait.